You'd never guess to look at the Baraboo/Dells region nowadays, but central Wisconsin was once a seemingly endless expanse of rocky glacial terrain teeming with wildlife and dotted with remote farming settlements barely hinting at the nearby state capitol. This is the setting of Amy Timberlake's One Came Home, a saga of feisty Georgie Burkhardt's search for her missing older sister. Her odyssey will bring her into the company of liars and criminals before returning her to her family with a renewed understanding of human strengths and weaknesses. This is a lot of territory for resident Scenic Designer Alan Donahue to recreate in an auditorium notorious for its restricted floor dimensions. Massive flocks of now-extinct passenger pigeons in flight can be represented by Julie Taymor-style puppetry, and the mules providing the wayfarers their transportation by a pair of stepladders. 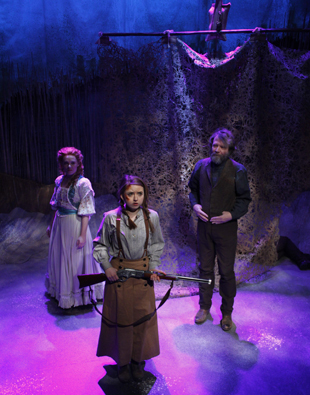 What conjures pastoral magic in Jessica Wright Buha's adaptation for Lifeline Theatre, however, is not the distant horizon painted on the canvas backdrop, or the dead weeds framing the stage perimeter, but a lace-like tangle of winter foliage affixed to a length of fabric big enough to conceal half the stage picture. This is no ordinary Bed-Bath-and-Beyond product, either. Dubbed "The Sail," the curtain itself is a fabric called "Kaos," constructed of what technical director Joe Schermoly describes as a twine-like fiber "felted" together by a process involving heat-pressing with a glue-like substance to stiffen the material and reduce the likelihood of its snagging on ambient protrusions. This is especially important because not only does this spectacular scenic device slide from side to side on a track, and swivel three-hundred-sixty degrees on a ceiling hook, but it can be swiftly raised to full height or lowered to the ground with the assistance of counterweighted pulleys. The major responsibility for its manipulation falls to the fugitive Miss Agatha, endowed by her abandoned sibling's imagination with almost mythical powers, and played by Amanda Jane Long. "I had been miming the business with the sail in the rehearsal room, but then we had only two weeks to practice with it before audiences arrived. Alan or Joe were on site every day, adjusting it to move more smoothly or to give us more control over it." Was it planned from the beginning to have this single object do all these different things? Donahue shrugs, "We started with a bunch of ideas. I remember one of them was based on the "wipe fades" in old movies. Between Joe and myself, we made it do everything we wanted—" he pauses and thinks for a minute, "except spin. You see it pivot in the show— but spinning it didn't create quite the graceful image that we thought it would." Long smiles as she recalls, "During tech rehearsals, Alan told me that I probably knew more about how the sail behaved than he did. That made me feel very accomplished." One Came Home runs at Lifeline Theatre through April 5.